The Longest Business Cycle In History? The U.S. stock market is in a 9 year bull market which makes many investors skeptical of the continued likelihood of market out performance. However, simple looking at the length of time without accompanying data to support this view that the business cycle is concluding is an irrational assumption. 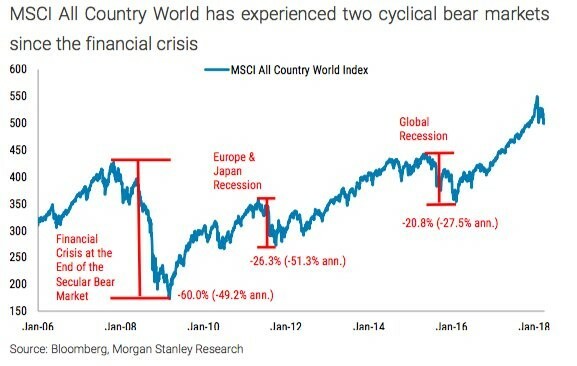 For instance, the chart below shows that there have been two cyclical bear markets in the MSCI All Country World Index since the 2008 financial crisis. Europe led the weakness in 2011-2012 which saw the index fall 26.3%. Then in 2015-2016 there was a global recession led by emerging markets which led to a 20.8% decline in the index. Since the global economy is much more synchronized now than at any previous point in history, as a function of globalization, could it be that the business cycle in the US could last for much longer than many skeptics realize? There’s a fear that everything that goes up must come down, but that’s a failed analogy to physics which doesn’t pass back testing. Stocks are not guaranteed to move up or down, so it’s wrong to expect them to fall simply because they are due to fall. This is the second longest business cycle expansion in US history. There is no law that states this can’t be the longest. To clarify, we are not stating that the US economy will defy a recession, simply that if you are arguing that the business cycle is nearing its end and entering into a recession, time alone cannot be your sole argument. As a reminder, markets can stay irrational longer than you can remain solvent. Another misunderstanding market skeptics have is they fear mean reversion. The most important category which these investors focus on is profit margins. However, as we’ve seen throughout history, margins are cyclical rather than mean reverting. At some point margins will fall, but that will be because of a recession, not because they are too far from the mean. The worst thing you can do is become dogmatic about certain indicators or relationships between indicators. The economy is a complex system that is much more nuanced than any simple back of the napkin discussion. Does the US have a debt problem? Yes, but that doesn’t mean that it can’t become a bigger problem over the coming decades. There is no law that states the the problem has to get resolved immediately. Linear thinking when it comes to the economy can be extremely dangerous for your capital preservation. Just because A is true, does not always mean that B will follow in a predetermined amount of time. Investors that become extremely US centric often miss worldwide developments, such as the weakness that has occurred in markets since the financial crisis. The markets haven’t been on a streak of perfection since 2009. The bearish investors also need to adjust their expectations because the stock market doesn’t always correct over 50% after the business cycle ends. Furthermore, the 2008 recession was a generational debacle which saw an extreme lack of liquidity and confidence. While you can argue that there are numerous problems that exist in the financial system today, we once again kindly remind you that just because A happened does not mean that B follows immediately. Having a default expectation of being extremely negative on the prospects following the next US recession could force you to miss significant market opportunities. As we have discussed previously, while there are many issues plaguing consumers, like student loan debt, this time the housing market is much healthier, unlike in 2008. Yes, in certain markets you can argue housing is overvalued, but not in a bubble. For something to be in a bubble it implies that everyone is investing in it and to make matters worse, using leverage. Does It Matter If This Is A Secular Bull Or Bear Market? Bearish investors love to focus on whether the stock market is in a secular bull or bear market. Rather than focusing on the tick by tick of the stock market, the big factor you want to try to predict is where the economic cycles will start and end. This is fundamentally different from defining whether stocks are in a secular bull or bear market because it doesn’t try to determine where the market will end up. Instead, this approach projects when the major market moves will occur and which direction they will occur in. If you are bullish on stocks in a bull market and aren’t worried about how high they are going, you can become reliant on the only factor which matters: the ability for earnings forecasts to be met in the next few quarters. While there is certainly merit in using valuation metrics to estimate long term equity performance, its important to understand that valuations only reveal the probability of a range of expected outcomes. The worst way to use valuations to predict long term future returns is to claim a forecast has a definite chance of occurring. With the high Shiller PE in 2018, some investors claim stocks need to fall or have zero returns in the next 10 years. It’s in vogue to have such dire predictions, but the truth is there is a much larger range of expected outcomes. It sounds terrible to say stocks will have annualized returns of 2% to 5% in the next 10 years, because that’s a wide range, but it’s the correct mentality to have. Looking at ranges prevents you from becoming an absolutist and missing out on opportunities. The key to avoiding losses is the ability to avoid large drawdowns. These low anticipated future annualized returns only matter before volatile periods. The final point we’ll make is valuations aren’t a catalyst for stocks. For instance, if the Shiller PE or forward PE reach a certain level, this in itself will not cause stocks to crash. As a reminder, just because A happens, doesn’t mean B is next. There’s value in scaling into and out of the market based on prices, but investors will only start to care about valuations when the earnings situation looks weak. To be clear, this is a criticism of misusing fundamental analysis to suggest that market timing is imminent or something that you can anticipate. In conclusion, avoid making absolute “if A is true that must mean B is true” statements when it comes to analyzing markets and the economy. Linear thinking does not work in a complex system. Focusing on the business cycle, using both hard and soft economic data, can be a much better tool to understanding potential market returns than focusing on technical analysis and tick by tick movements in markets.